Find a place for everything with the impact-resistant 10-compartment Organizer Tray from Ernst. This invaluable shop item is perfect for projects using nuts, bolts, washers, parts, tools--you name it. Any shop environment is in need of this tool. Rolled bottom edges allow small parts to be lifted out easily. It will fit inside shallow drawers in standard tool boxes. 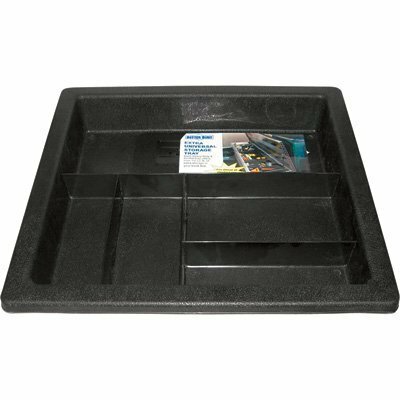 These sturdy trays are stackable and fuel and solvent resistant. Can even be used as a parts washing tray. Made in the USA. Lifetime guarantee. Tools not included. The Tool Sorter wrench tray - made in the USA - is compact, portable, and fits in most standard tool chest drawers. Up to 28 wrenches from 7mm - 1/4" (length up to 6.5") to 19mm - 3/4" (length up to 9.5") can be stored. 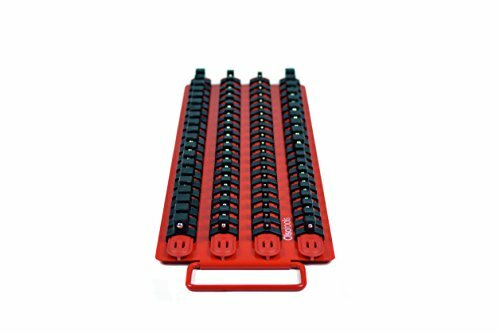 The unique feature is an integrated sorting bar - slide the wrench, flip it and it is stored in the right place. The sorting bar accommodates both SAE and metric. The tray measures 13.5" x 10" x 1.5" and is made of sturdy ABS. 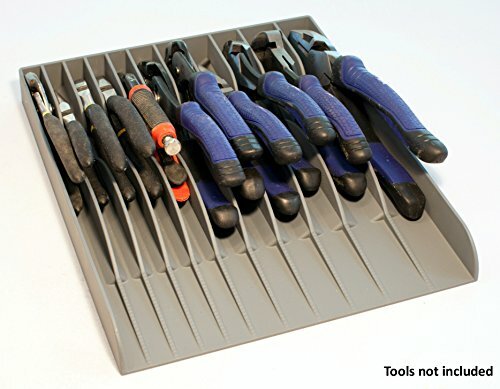 This organizer is an improved version of the previous Sortatool tray and works better with shorter wrenches. Reviews highlighted the quality of the product and its storage capacity. 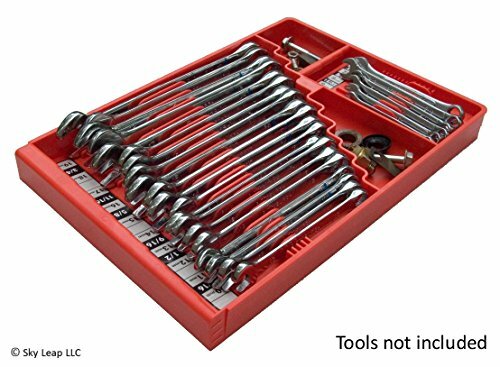 This tray is great for anybody with wrenches scattered in tool chests or boxes. Please note that wrenches are not held in place in the organizer! The Stanley STST41001 Portable Storage Tote Tray is a portable, multi purpose tool storage unit that makes it easy to carry your tools from one site to another. It has a rugged, deep design that is wide enough to transport drills, grinders & other larger tools. It features an updated design with reinforced structure through grids, and tool racks that keep tools organized and accessible. Tote dimensions: 19.34" X 13" X 7.6". 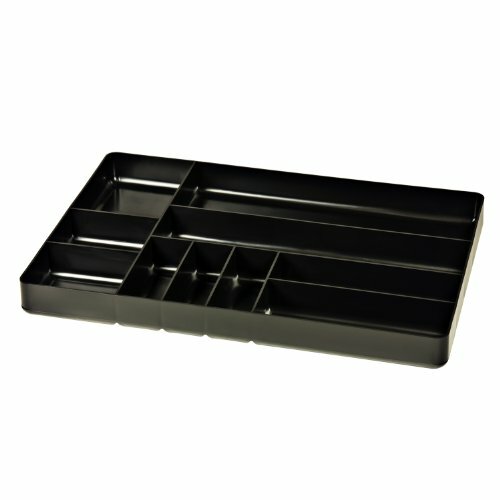 This sturdy 6 compartment drawer organizer tray is ideal for storing tools, nails, screws, tackle and any other small parts. The drawer organizer fits our 13 drawer industrial quality roller tool chest, without any wasted drawer space. Keep small tools and parts organized and unclutter your drawers. Finally all the various screwdrivers are in one place. This organizer offers plenty of space for long, short, stubby, or off-set screwdrivers. Or just store whatever has a shaft and handle and fits as shown in the picture. The maximum length of tools to be stored is 10.5". 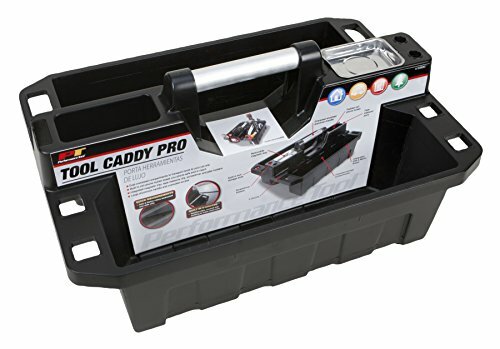 The low profile tray with dimensions of 13" x 10" x 1" can be used in shallow tool drawers and provides space for up to16 screwdrivers and 8 bits. 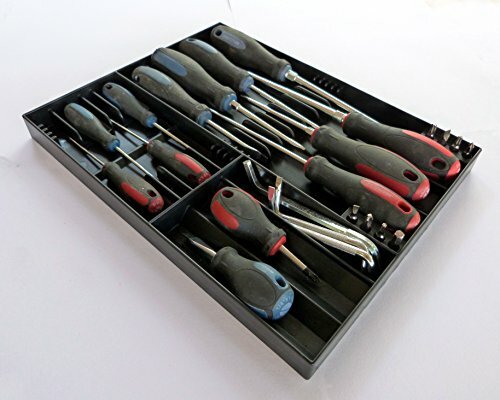 This organizer works with all types and brands of screwdrivers. Getting the typical random assortment or a set of screwdrivers stored is not a problem. Little compartments in the tray accommodate a range of handle sizes. Small troughs in the compartments limit movement of the tools in the tray. Please note that screwdrivers are not held in place by clips. This tray is compact, portable and made of sturdy ABS - you will feel the quality! This tray is a great addition to tool chests of professionals and serious DIY mechanics, and a very useful thing to have in every home. Tools are not included! 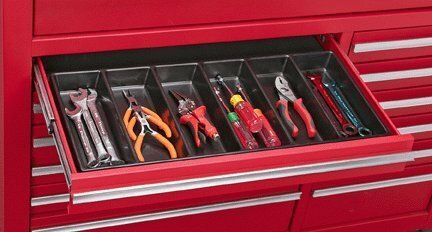 UWS-P-TRAYS UWS Tool Box Plastic Tray 18 5/8" x 19 3/8"
The Tool Sorter pliers organizer - made in the USA - is compact, portable, and fits in most standard tool chest drawers. Shallow drawers can be used with this low profile organizer. Fully loaded with pliers as shown in the picture total height was only ~2.5". Pliers are stored on edge in individual compartments which allows for storing up to 11 pliers in this compact tray. The width of compartments is 0.58" (5), 0.78" (2), 0.88" (2) and 1.18" (2) to ensure a tight fit for smaller and larger tools. The 12" long tray is open on one side; longer tools can be stored as well. The tray is designed to accommodate other tools as well as shown pictures. Small troughs in the storage compartments reduce movement of tools, but please note that tools are not held in place by clips or magnets. Note: Locking pliers may cause some headaches if they spring open with the tool chest drawer closed. Reviews highlighted the quality of the product and its storage capacity. This tray is a great addition to tool chests of professionals and serious DIY mechanics. Tools are not included! This 5-pocket Better Built Sliding Truck Box Storage Tray is a handy way to keep small items organized and easily accessible. Designed to fit most standard width truck boxes, including crossover and chest boxes. Also fits most full-size tool boxes with a 20in. width. Demonstration of how these trays can help keep your work area organised and tidy. Call Sealey on 01284 757500 or visit www.sealey.co.uk for more information. 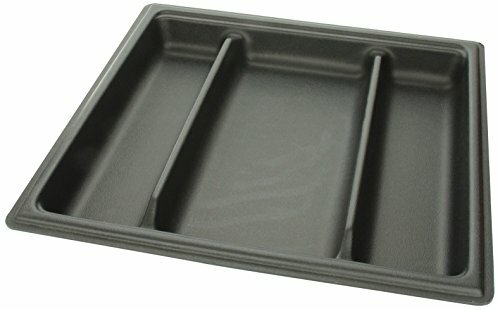 Compare prices on Tool Trays at ShoppinGent.com – use promo codes and coupons for best offers and deals. Start smart buying with ShoppinGent.com right now and choose your golden price on every purchase.